Stagecoach State Park is centered around the 780-surface-acre Stagecoach Reservoir. 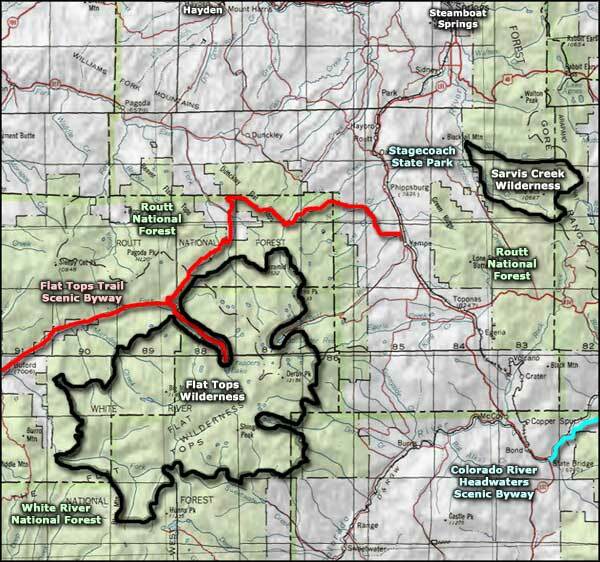 The park and reservoir are bounded on the east by Routt National Forest. This is a beautiful year-round destination south of Steamboat Springs that is renowned for its lake and river fishing, boating, picnicking, hiking, camping, snowshoeing and cross-country skiing possibilities. This area is so lush and abundant with wildlife that the Ute and Shoshone tribes have a long history of using the valley for hunting, gathering and making stone implements. French trappers and traders arrived in the early 1700's with cattle and sheep ranchers and miners coming after that. There was a stagecoach line operating through here up until 1907, that's where the name comes from. Sarvis Creek Wilderness is to the east, Flat Tops Wilderness to the west, accessible via the Flat Tops Trail Scenic Byway. The daily vehicle park pass costs $7, unless you have already bought an annual Colorado State Parks pass for $70. Primitive campsites cost $10 per night while slightly more developed but still basic campsites cost $16 per night. Campsites with electric cost $20 per night. The group campsite runs $60 per night plus a $10 reservation fee. The Group Picnic Area costs $60 per day plus the $10 non-refundable reservation fee. Anyone with a valid park pass and camping permit can use the dump station.